returning from Switzerland to work full time for Bremont. Bremont has used Boeing aviation-grade Ti-6-4 titanium, an extra-strong form of the metal. Bremont has used the material – with minute markers. The Bremont Boeing Model 1 Ti-GMT is £4,295. The Boeing Model 247 Ti-GMT is £4,995. recent military projects. This is the U-22. in last year’s MBIII makes an appearance again. The Bremont U-22 is £3,695. design into its core range in steel, including both time-only and chronograph models. departure for Bremont, and we’re all for it. including wooden parts, that were found in last year’s high-luxe limited editions). The Bremont Jaguar MKI is £8,450. The Bremont Jaguar MKII is £4,950. Lastly, Bremont has updated one of its most successful and longest-running watches, the Alt1-Z Zulu. and smartened up. This is the Alt1-ZT (apologies we didn’t get a better picture yet). shows a British brand that is, we think, maturing rather nicely. The Bremont Alt1-ZT is £4,795. Given my internet search habits another “English brand” has presented itself to me, Harold Pinchbeck. Their range is based on Swiss movements, both quartz and ETA mechanical. Here is what they say about they say about themselves. Harold Pinchbeck is not merely an ‘English brand’: each and every watch is actually designed, built and finished in this country. According to an article in The Mail on Sunday, about ten million watches are sold in the UK every year! Sadly, very few of these are actually made in Britain, a complete reversal of the situation of fifty years ago. We may be a small manufacturer, but we are doing our bit to reverse this trend. Photographs show how our watches look, but not the thought that goes into their making. The further up our range you look, the more you will find that your watch’s parts are made, not only in Britain, but by small engineering firms and individual craftsmen. It’s a joy to work with these people, whose expertise has been handed down through the generations. It is a world away from mass production. Just as in the 18th Century, each watch design begins its life on a sketchpad, although today it is soon transferred to a computer to create the working drawings. The small watchmaker has always employed the services of independent experts, and this is still true in the 21st Century. For example, our dials are made by the country’s oldest-established specialists, who made their first dials for a locomotive in 1820, and who now produce dials for some of the world’s most prestigious cars. Many of our steel parts are made by local engineers, who use the latest computer controlled machines to achieve the required accuracy. By contrast, the leather straps on our bespoke watches are created by a craftsman who uses no tools at all: just hand tools and traditional methods. And we are proud to include fine Swiss movements in all our watches. These parts are brought together in a workshop (not a factory), where a skilled craftsman assembles them into the finished watch. This work can’t be rushed: it’s painstaking, requiring good eyesight and steady hands! When he has built up a watch he examines it from every angle before testing it thoroughly, adjusting it as necessary to ensure reliability and accuracy. Eventually, the case will receive its final polish and inspection, and at this stage the handmade strap is fitted. Only then is the watch ready to be placed in its wooden presentation box, ready to be sent to its owner, together with the five year warranty. We believe that your watch should gratify your senses: the eyes, the hands and even (through our Tanner Bates straps) the nose. It might be an old fashioned approach, but we believe it makes a welcome change from the anonymous mass production of so many of those ten million watches! (Above) A Harold Pinchbeck hand-made Christopher watch in the making on the workbench. A truly unique watch being made by real craftsmen. Our watches are hand-built by craftsmen, at a workbench, in an English workshop. Knowing your watch has been made meticulously by human hands, and cared for at every stage, creates an extremely special watch that will be totally unique to you! “For the last 25 years, I have absorbed myself in designing and making complete and original pieces of horology in keeping with our great history of British watchmaking. My reputation and methods are entirely founded on being a British watchmaker in the truest sense of the claim; by making watches in their entirety in our studio including, most importantly, the movements. Today I am encouraged that much is happening with investment and job creation in watchmaking, as well as renewed interest in our rich horological heritage. Roger Smith is in a unique position to comment on this as the only protégé of George Daniels, regarded as the greatest watchmaker of the 20th century. Daniels, in many ways, was following Abraham-Louis Breguet who, in the 19th century, was outstanding because he was the finest watch and clock maker in France at a time when English watches and clocks were thought to be the world’s finest. Breguet sent his son to London to be apprenticed to John Arnold, England’s greatest watchmaker, because Breguet recognised the innovation and creativity in his work. Arnold devised the first series-produced marine chronometer, which enabled the Royal Navy to gain control of the seas in the decades following his death. The St Albans firm of Thomas Mercer & Sons carried on the tradition of making chronometers for the Navy and then for the rest of the world. Founded in 1858, the company, now based in Richmond upon Thames, still makes chronometers and a member of the Mercer family sits on the board. Currently only Roger Smith and Mercer & Sons make their timepieces as they were done in the 19th century, with every part made by themselves; but one of Mercer’s chronometers will cost at least £100,000 and a Roger Smith wristwatch will not be far off that sum. For these two firms there is no argument as to their right to call themselves British, but what right do the other firms named here have to the label? Some have their say above but I think they have every right, as all of their watches are designed in Britain and it is design that defines a watch. Consider the Dyson vacuum cleaner – we assume it is British made, yet it is assembled in Malaysia. It is just the same with the watches of Uniform Wares, Schofield or Valour. British design has always been adventurous; look at Sir Richard Rogers (who started on the route to making buildings where the mechanisms were visible after being given an Accutron Spaceview watch by his mother). If we are to deny these other British-based watch firms the right to call themselves British just because they buy their movements elsewhere, then where does that leave Swiss watchmaking? The majority of watches made in Switzerland do not use movements they made themselves, rather they will use good Swiss suppliers, such as Soprod, ETA and Vaucher, or Miyota, which is Japanese. Go to Omega’s website and read about its Co-Axial escapement. It was invented and developed by George Daniels from the Isle of Man. The brand’s president, Stephen Urquhart, has said that he believes Omega would not be what it is today were it not for Co-Axial. Innovation and high-quality engineering are great British traits. Take Formula 1: the teams bear the names of Germany’s Mercedes- Benz, Austria’s Red Bull or Japan’s Honda, but the cars are designed, built and tested in Britain. So, in many ways, the future of the British watch industry could not be brighter; it ranges from companies such as Uniform Wares, whose “less is more” design credo has made its watches an international hit. Then there is Bremont, which now manufactures all its cases in the UK and produces many of the movement parts in its Henley-on-Thames facility. Plans are under way to produce all the movement components and to assemble them in-house. Meanwhile, another British firm, Christopher Ward, has purchased a Swiss movement firm, Synergies Horlogères, and commissioned it to produce a brand-new movement. Or look at Robert Loomes, which takes British wristwatch movements from the Sixties and Seventies, when Britain last had an indigenous watch industry, and totally remanufactures them; Loomes also makes the cases and dials, thereby creating 70 jobs in the UK. So, for me, what makes a watch British is where the inspiration of the watch comes from — and for all the watches mentioned here, that place is Great Britain. Bremont is pleased to announce the arrival of Stephen McDonnell to its technical team. Stephen, originally from Northern Ireland, was senior instructor at Wostep in Switzerland before he left to pursue a career in movement design. Stephen has been instrumental in the design and prototype build of many great movements working with a number of the most prestigious Swiss watch brands, he is one of the few watch makers capable of designing and building complete movements by hand. Stephen has moved from Switzerland to join the ever increasing technical and design team at Bremont. This signing demonstrates Bremont’s continued investment of in-house, UK based skills as part of a long term investment in British watch making. Stephen qualified from Oxford University and moved to Switzerland in January 2001 to study at Wostep. While there, Wostep proposed that he remain with them and become an instructor. For 4 years he was the senior instructor at Wostep Neuchâtel, with responsibility for nearly all of the courses (full training, turning, refresher, restoration and complications). In 2007 he left Wostep and became independent and has since worked with the likes of MB&F, Christophe Claret, Maîtres du Temps and Peter Speake Marin for all aspects of design and prototyping manufacturing. He has also worked extensively in the restoration of vintage and complicated watches. Was this a lost opportunity ? 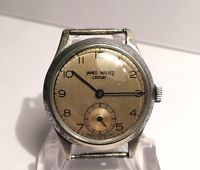 I have started looking at Smiths watches on e-bay and this nice watch came up. It apparently has a 15 Jewel Smiths movement. I didn’t follow the bidding very closely and it eventually sold for £67, which seems like a bargain. I will move faster next time. Jaguar and Bremont have announced two new watch collaborations. These exciting introductions will make their global debut at the Baselworld watch show, March 2015. The two British firms are cementing their long-term partnership following an overwhelming response to the creation of six Bremont chronometers which complement each of the six ‘continuation’ lightweight E-Type sports racing cars currently being built by Jaguar. In working to capture the E-Type’s essence in a wrist watch, Jaguar’s Director of Design Ian Callum and the creative team at Bremont homed-in on another of its signature features – the dashboard. At its heart are the speedometer and tachometer (or ‘rev counter’) and it is these that inspired the look of the new Bremont Jaguar MKI and MKII watches. The MKII, meanwhile, instantly transports the wearer back to the golden era of 1960s sports car motoring, its black dial carrying the Jaguar heritage logo above the six o’clock position and its hour markings being in the style of the numerals found on E-Type instruments. The classic chronograph layout – featuring two subdials at the three o’clock and nine o’clock positions – is achieved through the use of the beautifully decorated BE-50AE automatic movement which has been specially customised by Bremont to a unique specification, a subtle ‘red line’ on the 60-minute counter paying homage to the E-Type’s tachymeter. “Like the Bremont watch we designed to complement the Special GT, or ‘Lightweight’ E-Type continuation cars, the MKI and MKII pieces had to capture the spirit of what is undoubtedly one of the most iconic sports cars of all time in a subtle and intelligent way,” says Ian Callum. According to Bremont Co-Founder, Giles English, the watches have been created both to pay homage to the car and to satisfy a remarkable global demand. “When we worked with Ian to create the strictly limited edition of six watches to complement the Lightweight continuation cars, we had no idea that it would lead to a call from so many of the world’s E-Type owners and enthusiasts for a similar watch which was more accessibly priced and more widely available. “Although neither the MKI nor the MKII are limited edition pieces, there will be limited annual production so they will always remain as special as the cars that inspired them. The Jaguar E-Type sports car, created by former aircraft designer Malcolm Sayer, was unveiled outside the Restaurant du Parc des Eaux Vives during the Geneva Salon at 4.30 pm on March 15, 1961. Its radical appearance and promise of being ‘the fastest production car in the world’ caused near hysteria and resulted in 500 orders being placed during the show. It’s powered by a race-bred, six-cylinder, 3.8 litre, 265 horsepower engine that gave the car a top speed of 150 mph – yet, at £2,098 for the roadster and £2,197 for the fixed-head coupe, it cost less than half the price of a comparable Ferrari or Aston Martin. More than 72,000 E-Types were built, with around 12,000 being sold in Britain and the majority going to the USA. Celebrated owners included Frank Sinatra, George Harrison, Britt Ekland, Peter Sellers, Sir Jackie Stewart and George Best. The best Series 1 ‘flat floor’ E-Type roadsters now command more than £100,000. I have just found this article from last year on the website escapement magazine.com this article that describes a visit by Angus Davies to the Meridian actor in Norwich in September 2013. It is an interesting insight into the company. Angus Davies visits the factory of Norwich based Merdian Watches to see their range of Prime models. I hate being late for business appointments but I recently found myself lost in Norwich, despite having a satellite navigation system in my car. I had entered the wrong postcode and found myself on a residential street. It seems, even with the benefit of modern technology, we are still capable of becoming lost and sometimes regrettably late. However, navigational aids have come a long way, and like many, I sometimes take them for granted. In bygone times, marine chronometers would be employed to establish longitude and Britain lead the way thanks to the work of John Harrison et al. Ironically, my appointment was with a company named Meridian Watches whose branding pays due reverence to Britiain’s horological past. The company is owned by Simon Michlmayr, a former pupil of Peter Roberts, someone whom I personally hold in high esteem. Meridian Watches is a brand I have wanted to visit ever since seeing the Merdian Prime models at SalonQP 2012 and yet I found myself lost and late. Thankfully, my hosts were forgiving and very accommodating. Moreover, I was not to be disappointed. Simon Michlmayr, and his colleagues, have been repairing and servicing clocks and watches for a number of years. Indeed, Michlmayr and his colleagues have been seen, suspended by a series of ropes, attending to church clocks at perilous heights, abseiling into position with tools in hand. Michlmayr has a passion for adventure and cites rock climbing as a personal interest. It is this Boy’s Own lifestyle which lead Michlmayr to conceive a range of quality, robust timepieces to challenge the many watches available from Switzerland and Germany. Although, Meridian Watches have used Swiss ébauches in their range of masculine timepieces, other components whenever possible have been sourced locally. Furthermore, much added value takes place within the confines of the factory in Norwich. Dials are of a sandwich type construction with numerals and indices cut-out to reveal a luminous layer below. The dials are made in-house and painted by hand. They proffer excellent legibility and, whilst modern in design, feature a triangular index at noon, typical of historical pilot’s watches. Customer choice is at the centre of the Meridian paradigm, with several opportunities for personalisation by utilising different coloured hand and dial combinations. Subsidiary seconds feature at 6 o’clock or 9 o’clock, dependent on model. Hour, minute and second hands are open-worked revealing more of the dial surface beneath. The stainless steel hands are made, polished and painted on the premises. This a was surprising observation, as ordinarily I see these components supplied to watch companies packed in boxes ready for assembly. Currently the case diameter of all Meridian Watches is 46mm. Each one is hewn from a solid billet of stainless steel. The result is a case which looks capable of withstanding apocalyptic trauma. Whilst some may find the case too large, I found it perfectly suited my larger than average wrist. The short lugs appear to entice the strap to cosset the wrist ensuring elevated wearer comfort. Plans are in place though to produce a 42mm version in the future. I looked at various models, the majority of which had a solid caseback engraved with the lines of longitude and the inscription, “Made in England for the world”. However, one model, a prototype for a corporate client, had an exhibition back which I particularly liked. It seems with the vast amount of hand finishing bestowed upon the movement within, Meridian should share this added value with the wearer. Nevertheless, I accept some readers will disagree and a solid caseback does afford greater robustness, something Mr Michlmayr holds dear. Attention to detail is evident when you closely examine the case of the watch. Despite much fondling of the case, I could not find a sharp or rough edge anywhere. The straps are secured with hexagonal screws and look as though they will never come adrift without deliberate loosening using the hex keys provided. The high quality leather straps are complemented with stainless steel buckles. Once more they are made in-house. They feature an integrated roller to facilitate ease of fastening. It seems remarkable that the company has chosen to make these items in-house when cheaper, mass produced items, are readily available. However, this demonstrates once again, the company’s the fixation with producing thoroughly engineered components. The crown features a degree symbol on its vertical flank acting as a means of indicating when the crown is adequately tightened. It sounds a small detail but should help mitigate the risk of overtightening that can result in seal damage. The movements are Swiss-made Unitas 6497/98 calibres from ETA although much modification takes place in-house. The bridges and mainplate are gold plated, affording a traditional finish, typical of old pocket watches. Lines of longitude are applied to the movement using hand engraving and bridges are hand-frosted. The deft chamfering of the bridges is a further indication of the matchless finishing observed during my time on site. Screws are replaced with hand-blued items. These screws are not blued using chemicals but subjected to heat to achieve the regal tincture and hardness, traditionally found on the finest watches. The movements are hand-wound and have a power reserve of approximately 40 hours. However, I did see some new movements in development which confer a greater power reserve of 100 hours. Indeed, one member of staff, Craig Baird, was wearing a development watch containing the prototype movement along with red details on the dial; I would dearly have loved to take this particular watch home with me. A screwed-balance features within the movement. It allows finite adjustment when poising and once again reaffirms that the watches bearing the Meridian name are quality items. I was profoundly impressed with the passion exampled in Norwich and the high quality products which leave the factory. Simon Michlmayr set out to create a robust watch that can be worn every day although the result is anything but everyday, it is so much better. The dimensions of the case may prove too large for some, but with a 42mm version in the pipeline, those seeking smaller dimensions should soon find a watch which meets their needs. The mania for creating quality components at times beggars belief, even the hinges on the wooden presentation case are made in-house. In some larger concerns, the stereotypical bean-counters would rein in the artisans and insist on procuring cheaper items elsewhere. I am pleased to say that the artisans prevail at Meridian Watches and most components are made in-house or sourced locally. Whilst I clearly struggled to find my way around the urban streetscape of Norwich, depicted on my satellite navigation, Mr Michlmayr knows the area well. Like an accomplished chef, those components he does not make himself he endeavours to source from local suppliers and the resultant recipe is a mouth watering proposition. Case: Stainless steel; diameter 46.00 mm; water resistant to 30 bar (300 metres); sapphire crystal to front; solid caseback. Functions: Hours; minutes; subsidiary seconds. Strap: Leather strap presented on a stainless steel pin buckle. QP: Your new watch is a bit of a departure from the Signalman and Blacklamp watches – tell us what the idea is behind it. Giles Ellis: It’s called the Beater. A beater watch is one you wear all the time, on the chance that you might be doing some DIY or emptying the shed, without having to go inside and change your watch. It is something you’re happy to scratch and mark. This helps you get past the bubble of anxiety that comes with any luxury purchase, before you scratch it for the first time. When you go on watch forums, it’s how people refer to it, as their ‘beater’ watch. QP: A rough-and-ready watch doesn’t sound very “Schofield” – the Signalman and Blacklamp were designed to within an inch of their lives. Is this simplicity, Giles Ellis-style? GE: It’s simplicity, but making sure that I’m happy with it. Everything I set out to do with the Beater, I did, which was unusual. There were no deviations from the original design brief. We’ve done an enamel dial, which I’ve always wanted to do. Enamel is normally delicate. We found someone who could do it differently for us; the finish looks like the stove enamel on an Aga. It’s slightly ripply, we’re not going for the super-smooth finish you’d normally associate with enamel. They’re coming in very “Farrow and Ball” colours, all printed in the UK. There are three different case materials; bronze, titanium and steel. They’re all finished in-house – we’ve invested in a lot of finishing kit. The bronze cases are bead-blasted and force-patinated twice over. The titanium is heat-treated, and the steel is finely bead-blasted and brushed. It’s what in the knife industry is called “hand-rubbed”. It’s very finely scratched in a non-uniform way. Almost satinated. The titanium comes out a very dark slate blue, it’s wonderful. The first few watches will be the SalonQP batch. That may only be the first 15-20 of each material, and then the finishing recipe will change slightly, especially for the bronze. QP: Most people’s “beater” watches are something cheap and cheerful, that will be replaced; this is designed to last. Is it better to think of it as a “luxury beater”? GE: It is a very luxurious beater, and it costs us an enormous amount of money to make. We could have marketed it at a higher price, but it suits our business model, very patiently, to put it out there at a cheaper price. It would be a tougher sell at a higher price, but when you see it, there is quite a lot of watch for your money – I get carried away, and add value at every step. It will cost £2,800 inc. VAT in the UK, with the titanium version being £100 or so dearer, just down to the material costs. I think we’ll sell more than before. I think there are a lot of people who would like to subscribe to Schofield watches who just can’t afford to. The Beater should fulfill that. The Blacklamp is super-cool, but it’s an expensive watch. The Signalman DLC was the same – we still receive enquiries for them although we’re not making them any more. The best we can do is facilitate the odd “pre-loved” sale, which only happens occasionally. QP: If it’s such a rugged watch, why give it a sapphire display caseback? The new-old stock ETA movements we’re using are marked Synchrom in gold. Synchrom was an old watch manufacture, and they were bought out later by Doxa. We decided they look so great that we didn’t want to badge over it, change it, or hide it with a closed caseback. It adds exclusivity to any watches we make – there are only so many, and when they’re gone, we have other movements we use in their place. They all have different charm, and history. You could end up with a one-off in terms of movement and case patination. QP: Your watches have become known for some of their stylistic flourishes, like the “slash zero” at 12 o’clock. Can we expect similar touches on the Beater? GE: I’m very proud of the crown on the Beater. It actually cost more than the Blacklamp crown – which had a luminous tritium gas insert embedded in it. It’s a bead-blasted stainless steel crown, with lots of concentric circles like the Fresnel lens [a key design trope that harks back to the Signalman’s lighthouse motif, something that became almost an unofficial Schofield logo] engraved on the front, then paint-filled. We had to do it so that you don’t get a groove where the engraving was, but the lines are very fine, so it’s very hard to do. They’re real little beauties. Then there are the straps. We’re using English leather, which comes very cracked. We call them the Tiger Loaf because that’s exactly how they look. There’s a black, a dark brown and a tan. GE: We’ve gone for Sussex and England on the dial. It has become the brand’s strapline – it comes from old cricket bats. Players used to play for Sussex and England, so the bats had that written on them. I love the quirkiness of the language. People often query it, but it’s very pertinent to how we do business – so much of it is right here in Sussex, and a lot of the rest is in England. I wanted more of it to be made in England than the Blacklamp, but only if it could be creative and original. We don’t use one-stop-shop suppliers for our accessories at all. Every component in the box, even the paper that wraps the chamois leather, comes from a separate supplier. QP: You launched the watch at SalonQP, where you launched the brand four years ago, and where you have made all of your watch launches so far. What is it about the show that appeals to you? GE: It’s no exaggeration to say that we gear our entire year around SalonQP. We chase our suppliers all year to get everything ready. I’m raring to go by the time it comes round. I’ve been every year that it’s been held in the Saatchi Gallery – I feel like a vet’ now, even though we’re only four years old. I think it was the first year, I said that with James [Gurney]’s help, we had a wonderful synergy going. I’m not going to try and be like everyone else, and try and launch products at Baselworld. I get lost in the noise, I’m too small. It’s degrading and depressing – not something I ever want to pay for! I’m not interested in Basel, so I stay at SalonQP. Being that it’s an English watch fair, it’s the obvious choice for us as an English watch company. QP: You’ve been making watches as Schofield for several years now. What have you learnt about the business? GE: The biggest challenge of all isn’t launching a product that people will like, it’s staying in business. This is a very difficult business to stay in. You see people launch watches, and they don’t really sell, it fails and goes under. One of the things I’m most proud of is that I’m still in business. There have been dramas and politics, and all sorts. There’s a lot of regret and wasted money in watchmaking. QP: Where exactly do you find the time? It seems like there’s nothing produced by Schofield that hasn’t been thought through to the tiniest detail. GE: People do often ask me where I find the time. I really don’t know. I do work long hours. I live and breathe Schofield – I do a lot of thought before I sit down on a job. Design for me is mostly quite intuitive. It’s not what takes the time, unless it’s something tricky like the torch for the Blacklamp. QP: Between making watches, you’ve also put your name to a fountain pen. What was the thinking behind that? GE: It’s a bit of a game really. Many watch companies launch a fountain pen and go completely mad, making something that could never be written with, it’s so heavy, ornate and overly-engraved. I collect fountain pens, and I appreciate that you want a pen that isn’t so flash that you’re self-conscious on the train, or that you’re worried about dropping it. So it wasn’t going to be unbalanced or overly gilded. I wanted it to have all the integrity of any large-production fountain pen – Onoto, Caran d’Ache, you name it. I naturally gravitate towards Japanese pens – they’re very big on fountain pens in Japan. They often have tapering bodies, with no pen clip; I melded Japanese and English aesthetics. They’re hand-made on lathes in the UK and put together by Onoto. We’re using Onoto nibs as well – a nib is one thing I think we would struggle to make properly. GE: Yes – the clip looks like the Blacklamp hands, which we’re also using on the Beater. It’s quite sartorial; they look like a necktie as well. The lid has an onyx cabochon, which we were very pleased with. Someone tweeted that it’s twice the price of a Montblanc – well, it has thrice the amount of silver in it, all hallmarked in Birmingham. And of course, the pen isn’t just a pen. It comes with a writing kit, and the box is the most elaborate box we’ve ever made. We even made our own ink to go with it.